Consumer reporting agencies in Maryland will soon have to comply with new regulations. Legislators recently passed House Bill 848, which places registration and surety bond requirements for such agencies in the state. The bill was approved by the Governor Lawrence J. Hogan, Jr. on May 8th, 2018. The rationale for the stricter rules is to introduce a better regulatory framework for consumer reporting agencies in Maryland. This aims to ensure higher standards of operation and preventing potential issues with agencies’ activities. Below you can find the most important changes brought by the new bill. 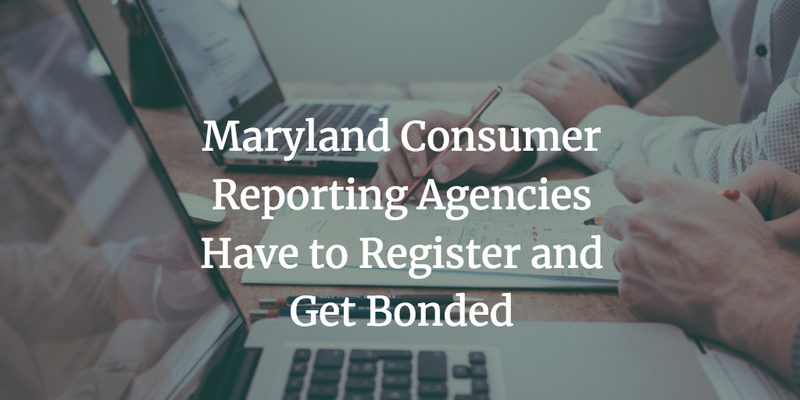 With the new changes, consumer reporting agencies that want to operate on the territory of Maryland have to register with the Commissioner of Financial Regulation. The registration entails meeting a number of requirements that guarantee the agency’s suitability to conduct its intended activities. The registration should be renewed on an yearly basis. It should be done via the website of the Nationwide Mortgage Licensing System and Registry (NMLS). One of the criteria you have to meet to obtain a Maryland registration is to post a surety bond or irrevocable letter of credit. The amount of the security is set by the Commissioner on a case-by-case basis. However, it cannot exceed $1 million. Typically, applicants prefer to get a surety bond, as it does not require obtaining the whole required sum, as with letters of credit. The goal of your surety bond is to guarantee your legal compliance. It is conditioned on your abiding to applicable laws. A party that suffers damages due to illegal actions on your side can seek a compensation through a surety bond claim. The aggregate liability is limited to the bond amount you have obtained. Furthermore, the surety bond should be active for three years after you have stopped your operations as a consumer reporting agency, or after it has been cancelled. Your surety bond is required in order to protect the state and its citizens from potential unlawful activities you may engage in. it can be used to provide a financial reimbursement to harmed parties. In this sense, when you get bonded, it’s like receiving an extra line of credit that serves as a security in front of relevant authorities. In order to get a surety bond, you have to cover only a small percentage of the bond amount you are required to post by the Maryland Commissioner of Financial Regulation. This is your surety bond cost. It is based on your personal and business finances. If they are solid, the premium you can expect is about 1% to 5% of the bond amount. The most important factors that affect the bond price are your personal credit score and business financials. Other criteria that your surety may consider when formulating the cost include professional experience, as well as liquidity and assets you present. The more stable your overall profile is, the less you’re likely to pay to get bonded. In case you have further questions about your bonding, you can always contact us at 866.450.3412.